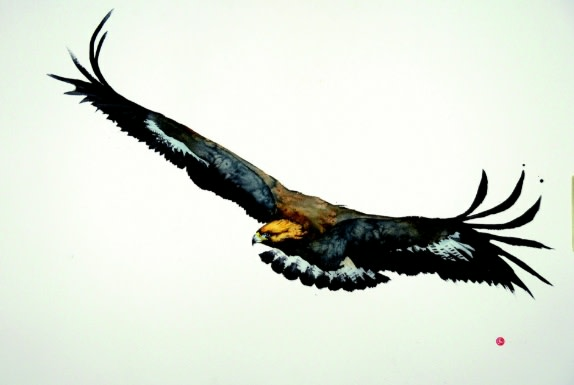 We are delighted to announce another Solo Exhibition by the artist Karl Martens depicting his magnificent strong watercolour painting of birds. This show opens at the gallery on Friday 11th May 2018, when Karl will be with us for the Private View between 6-8pm. Karl has been with the Wykeham for many years now and has a huge following for his instantly recognisable works. He is a follower of Zen Buddhism, as well as Japanese and Chinese Calligraphy and Zen art. He believes that by letting go of control he is then able to connect with his intuition thereby achieving his highest potential. Karl uses this technique to achieve this “no mind” state where the intellect is disconnected and he can then feel his way in this “void of thought”. Having always been fascinated by birds and since engaging in this method of painting, an entirely new way of working emerged the more he dared to let go. The whole process is very quick, beginning with the holistic brush stroke, which is the first stroke and determines the entire body of the bird before thoughts begin to re-enter Karl’s mind which then disturbs his intuition. The face is then added in greater detail later which is when the bird’s own character emerges. This show is a stunning collection of Karl’s work, celebrating both Western and Eastern cultures, and should not be missed.